Talisay Wall and Point is one of the best diving sites off Moalboal with vertical drop-offs and loads of marine life. Talisay Wall is a variable dive with a slope and wall. There a several caves to be found and explored. There is lots of black coral, bat fish, barracuda, mandarin fish and sometimes a turtle. Because of the combination of slope and wall, this is also a great place for a night dive. Talisay Point is a beautiful slope, full of hard corals mixed with soft and leather corals. You can find bat fish, crocodile needle fish, turtles, sea snakes, frogfish, anemones with shrimps and clownfish to name but a few. In the evenings mandarin fish will come out in search for food. Mandarin Fish and also all other Macro marine species count to the must seen here on this divespot. 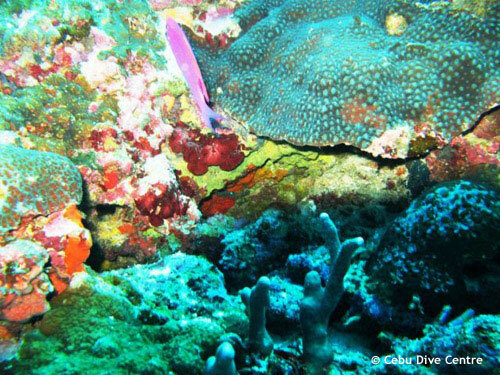 You dive in waters a little bit deeper, but you can enjoy the nice wall full of colourful corals and fish. Just relax and enjoy it.